The present volume provides an annotated English translation of the last section of Dharmakīrti’s Pramāṇavārttikasvavṛtti (PVSV 164,24–176,16, ad stanzas 1.312–340), which includes his final assault on the Mīmāṃsā doctrine of the authorlessness (apauruṣeyatva) of the Veda. Dharmakīrti draws out the apparently fatal consequences of this doctrine: If the Vedic scriptures are without an author, hence without an underlying intention, they can only be meaningless. Even if they have a meaning, it must be supersensible. But then, claiming that the leading Mīmāṃsaka authorities – Jaimini, Śabara – possessed privileged cognitive access to its supersensible meaning is not an option, since the Mīmāṃsaka denies that humans have any supernatural form of knowledge. 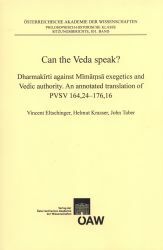 In short, Dharmakīrti forces his opponent to admit that the Veda is nothing but a mutus liber, a “mute book.” Besides questioning the very possibility of Vedic hermeneutics under Mīmāṃsaka presuppositions, the passage translated contains interesting allusions to Dharmakīrti’s linguistic theory, his views on scriptural authority, his critique of the Veda’s reliability, and his understanding of the transmission of the Veda and Vedic śākhās (“schools”, “recensions”). The section includes Dharmakīrti’s polemics against a mysterious vṛddhamīmāṃsaka (“ancient Mīmāṃsaka”). An introduction (pp. 7–21: “The Place of PVSV 164,24–176,16 in the work of Dharmakīrti,” by V. Eltschinger), a synopsis of contents (pp. 23–30) and two independent essays round off the volume. H. Krasser’s “Logic in a Religious Context: Dharmakīrti in Defence of āgama” (pp. 83–118) sheds new light on Dharmakīrti’s conception of scriptural authority and its indebtedness to Dignāga. J. Taber’s “Dharmakīrti and the Mīmāṃsakas in Conflict” (pp. 119–149) explores the guiding principles of the Mīmāṃsā system of exegesis and assesses the relevance of Dharmakīrti’s arguments against it. A general bibliography and various indices complete the volume.